The Secret Service of the Post-Office Department: As Exhibited in the Wonderful Exploits of Special Agents or Inspectors in the Detection, Pursuit, and Capture of Depredators Upon the Mails. 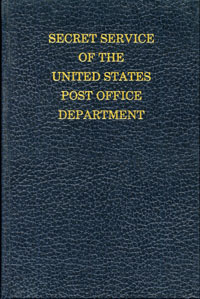 Originally written in 1885 by the Director of the U.S.P.O. Secret Service this book contains hundreds of true stories on the criminal and security aspects of the Postal Service related via stories of escapades of criminal and agents. The book is illustrated with 160 woodcut engravings. Edition: June 1978 Reprint by Sanford J. Durst from the original 1885 version.